Intel Corporation introduced the Intel Atom processor S1200 product family today, delivering the world’s first low-power, 64-bit server-class system-on-chip (SoC) for high-density microservers, as well as a new class of energy-efficient storage and networking systems. The energy-sipping, industrial-strength microprocessor features essential capabilities to achieve server-class reliability, manageability and cost effectiveness. As public clouds continue to grow, the opportunity to transform companies providing dedicated hosting, content delivery or front-end Web servers are also growing. High density servers based on low-power processors are able to deliver the desired performance while at the same time significantly reduce the energy consumption – one of the biggest cost drivers in the data center. However, before deploying new equipment in data centers, companies look for several critical features. The Intel Atom processor S1200 product family is the first low-power SoC delivering required data center features that ensure server-class levels of reliability and manageability while also enabling significant savings in overall costs. The SoC includes two physical cores and a total of four threads enabled with Intel Hyper-Threading Technology (Intel HT). The SoC also includes 64-bit support, a memory controller supporting up to 8 GB of DDR3 memory, Intel Virtualization Technologies (Intel VT), eight lanes of PCI Express 2.0, Error-Correcting Code (ECC) support for higher reliability, and other I/O interfaces integrated from Intel chipsets. The new product family will consist of three processors with frequency ranging from 1.6 GHz to 2.0 GHz. The Intel Atom S1200 product family is also compatible with the x86 software that is commonly used in data centers today. This enables easy integration of the new low-powered equipment and avoids additional investments in porting and maintaining new software stacks. Intel continues to drive power consumption down in its products, enabling systems to be as energy efficient as possible. 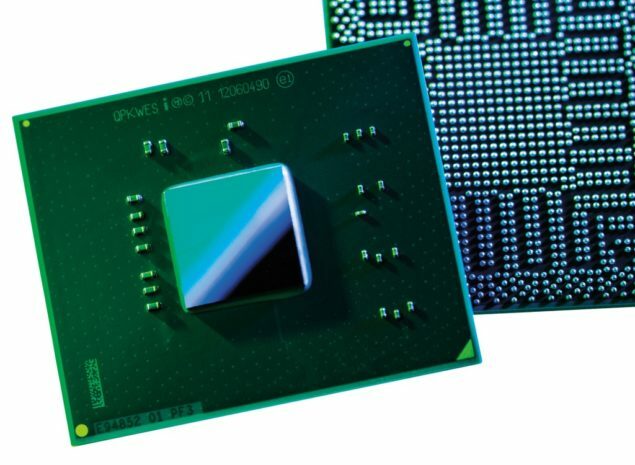 Each year since the 2006 introduction of low-power Intel Xeon processors, Intel has delivered a new generation of low-power processors that have decreased the thermal design power (TDP) from 40 watts in 2006 to 17 watts this year due to Intel’s advanced 22-nanometer (nm) process technology. The Intel Atom processor S1200 product family is the first low-power SoC with server-class features offering as low as 6 watts of TDP. Today, more than 20 low-power designs including microservers, storage and networking systems use the Intel Atom processor S1200 processor family from companies including Accusys, CETC, Dell, HP, Huawei, Inspur, Microsan, Qsan, Quanta, Supermicro and Wiwynn. Intel is working on the next generation of Intel Atom processors for extreme energy efficiency codenamed “Avoton.” Available in 2013, Avoton will further extend Intel’s SoC capabilities and use the company’s leading 3-D Tri-gate 22 nm transistors, delivering world-class power consumption and performance levels. For customers interested in low-voltage Intel Xeon processor models for low-power servers, storage and networking, Intel will introduce the new Intel Xeon processor E3 v3 product family based on the “Haswell” microarchitecture next year. These new processors will take advantage of new energy-saving features in Haswell and provide balanced performance-per-watt, giving customers even more options. The Intel Atom processor S1200 is shipping today to customers with recommended customer price starting at $54 in quantities of 1,000 units.